Motor activity in the brain precedes our awareness of the intention to move, so how is it that we perceive control? It's a Saturday afternoon in midwinter, and, having just finished all of his weekend chores, a man sits down by the fireplace to read his favorite novel over a hot cup of coffee. As the daylight in his apartment fades, he reaches out to flick on a lamp switch. With more light, he makes himself comfortable and begins to read. We all recognize this scenario, or one like it. Every day, we perform actions that create some state of affairs in our external environment, such as increasing the level of light in a room. Although we pay little attention to such actions, we believe that we—through intentions and decisions—control the movements of our arms and hands. That sounds plausible enough, but it can be quite difficult to prove. Any action—even one as simple as turning on a light—consists of many parts. In this lamp-switch example, the man realizes that the room is too dark to read and forms the goal of making the room brighter. To achieve this goal, the reader decides to turn on a light. More specifically, this reader forms an intention to reach for a switch and then executes the movement to achieve that goal. So the overall action encompasses a number of events: formulating a goal, formulating an intention, initiating the movement and actually turning on the lamp switch. Could the order in which we experience such events create our subjective experience of control? We seem aware of a certain temporal order of events that contributes to our perception of the direction of causation that flows from within our minds (such as formulating an intention) to external space (such as turning on a light switch to light up a room). Nonetheless, our feeling of control could come from more than the order of events. To understand the neural basis of the human perception of control, scientists must study the sequence of subjective experiences and see if they follow a pattern of neural events with the same characteristic order. More than a matter of simply turning on a switch, this feeling of control over actions might even contribute to a conscious sense of self. In other words, I am because I control my actions. The question is: How do we go from mundane, everyday actions—like turning on a light—to developing a sense of self as a causal agent? One can try tries to answer that question by examining the subjective sensations that humans experience during actions, the corresponding activities in the nervous system and the subjective experiences of individuals who do not have an ordinary sense of control. As we shall show, recent evidence from the field of cognitive neuroscience sheds light on the brain processes that underlie our sense of conscious will. Moreover, this evidence also indicates that we may not control our actions with entirely free will. In 1983, Benjamin Libet and his colleagues at the University of California, San Francisco published a profoundly influential paper on the source of control. In this study, participants watched a small clock hand that completed one full revolution in 2.56 seconds. While fixated on the clock, a participant voluntarily flexed his wrist at a time of his choosing. After the movement, the clock hand continued to rotate for a random time and then stopped. Then, a participant reported the position of the clock hand at the time when she first became aware of the will to move. Libet and his colleagues called this subjective judgment W, for "will." In other parts of the experiment, participants judged when they actually moved, and Libet called this judgment M, for "movement." The timing of the W and the M told Libet and his collaborators when—subjectively speaking—a participant formulated a will to move and actually moved. In addition, Libet's team measured two objective parameters: the electrical activity over the motor areas of the brain, and the electrical activity of the muscles involved in the wrist movement. 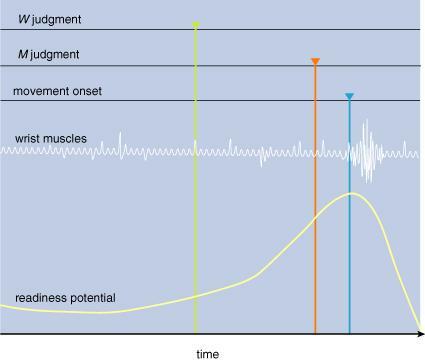 Over the motor areas, Libet recorded a well-known psychophysiological correlate of movement preparation called the readiness potential (RP), which Hans H. Kornhuber and Lüder Deecke first described in 1965. The RP is measured using electroencephalographic recording electrodes placed on the scalp overlying the motor areas of the frontal lobe, and appears as a ramplike buildup of electrical activity that precedes voluntary action by about 1 second. By also recording the electrical activity of the muscles involved in the wrist movement, Libet precisely determined the onset of muscle activity related to the RP. Libet and his colleagues examined the temporal order of conscious experience and neural activity by comparing the subjective W and M judgments with the objective RP and muscular activity. First, the investigators found that, as expected, W came before M. In other words, the subjects consciously perceived the intention to move as occurring before a conscious experience of actually moving. This suggests an appropriate correspondence between the sequence of subjective experiences and the sequence of the underlying events in the brain. But Libet also found a surprising temporal relation between subjective experience and individual neural events. The actual neural preparation to move (RP) preceded conscious awareness of the intention to move (W) by 300 to 500 milliseconds. Put simply, the brain prepared a movement before a subject consciously decided to move! This result suggests that a person's feeling of intention may be an effect of motor preparatory activity in the brain rather than a cause. As Libet himself indicated, this finding ran directly contrary to the classical conception of free will. Subjects watch a virtual clock on a computer monitor that completes a revolution in 2.56 seconds and voluntarily moves his wrist. 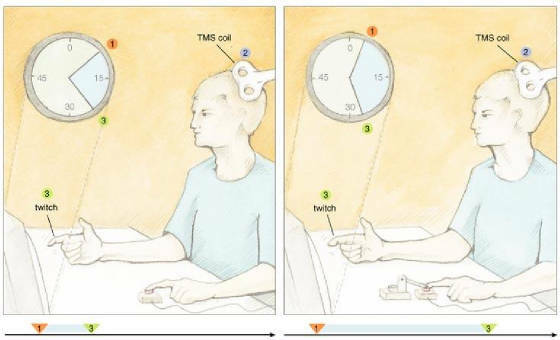 In some experiments (left), he notes the position of the hand on the clock when he decides to move his wrist. After the action is made, he reports this tie, which is called the W judgment for the will to move. In other experiments (right), a subject notes when he thinks that he actually starts moving, which is called the M judgment for movement. In both cases, the investigators measure the so-called readiness potential from the motor cortex and the muscles that make his wrist move. New evidence suggests that awareness of intention relates more closely to the onset of a later component of the RP that is known as the lateralized readiness potential (LRP). Although the RP develops on both sides of the brain for any motor activity, the LRP develops in just one hemisphere—the one opposite of the side where the action will be made. That is, because the left side of the brain controls motor activity on the right side of the body, and vice versa. The one-sided nature of the LRP makes it a more specific correlate of movement preparation than the RP. Also, the LRP develops about 500 milliseconds before movement, which is after the general RP. In 1999, one of us (Haggard) and Martin Eimer measured RPs and LRPs in a Libet-type experiment at the Max Planck Institute for Psychological Research in Munich. The results showed that a subjects' conscious experience of the intention to move covaried with the LRP rather than the RP. This suggests that awareness of intention correlates with the choice of which movement will be made, rather than simply that a movement of some kind will be made. This suggests that the conscious experience of control may be linked to the brain process that selects how we will use a particular movement to achieve a general goal. For example, the experience that precedes turning on the light in our example might be linked to the decision about which hand to use to reach for the switch. However a scientist looks at all of these data, the brain is going full speed ahead well before a person experiences the conscious intention of moving. Consequently, no role appears for conscious processes in the control of action—or so it might seem. Although the results of Libet and one of us (Haggard) cast doubt on whether conscious processes cause actions, these data remain consistent with the idea that conscious processes could still exert some effect over actions by modifying the brain processes already under way. The fact that conscious awareness of intention precedes movement by a couple of hundred milliseconds means that a person could still inhibit certain actions from being made. Libet apparently replaced free will with free won't. In some ways, Libet's findings suggest that a person's brain jumps the gun, or gets a head start, since movement-related neural activity comes before a person experiences the intention of making the movement. In addition, Libet found another seeming false start: A person's subjective judgment of when movement started came an average of 86 milliseconds before the onset of electrical activity in the muscles specific to the movement. That means that our subjective experience of the beginning of the movement must also come from some premotor process—something that takes place before the muscles themselves contract. Although some investigators questioned the validity of the timing as judged by subjects in Libet's experiment, his results have had considerable impact and have been interpreted as casting serious doubt on the existence of a mind-body chain of causation. Moreover, numerous other studies now confirm the phenomenon of anticipatory awareness of action. These experiments reveal that the chain of causation going from our intentions to our actions is not in the intuitive direction. If we are not aware of our actions when we believe we are, then what are we perceiving? This question leads us directly into a minefield that surrounds the free-will debate. Instead of risking a philosophical firestorm, we might sidestep free will and pursue more scientifically accessible questions, such as: How does our conscious sense of free will arise from the neural activity of the brain? Our judgments about the timing of our movements are poor and seem to be anticipatory. A number of pre-motor processes, including volition, intention and preparation, might contribute to the experience of an action being initiated. When we make movements in our everyday life, our brain performs processing tasks for successful performance. Once a goal is specified, our nervous system selects a motor plan to achieve it. This task—creating the control signals to orchestrate a movement—takes intense computation, which is reflected in the relatively limited movement repertoire of even the most sophisticated robots. Since our conscious intention to move correlates with the onset of the LRP, our awareness of moving appears linked to the planning of a specific movement. Once the nervous system picks a motor plan, it gets executed by the primary motor cortex, also called MI. In the planning of movement, activity takes place in so-called premotor areas, which send signals to MI. Then, MI activates motor neurons in the spinal cord that innervate specific muscles that cause a movement. In an attempt to find the neural substrates of our awareness of action, one of us (Haggard) and Elena Magno, now a postdoctoral fellow at Trinity College in Dublin, used a Libet-like experimental setup. In these experiments, subjects pressed a key when they heard a sound, and the equipment measured the reaction time. In addition, subjects judged their reaction time by reporting the position of a hand on a rotating clock when they thought they pressed the key. These experiments also included an ingenious twist: transcranial magnetic stimulation (TMS). In TMS, a large, rapidly changing magnetic field applied to the scalp delivers electrical stimulation to a specific area of the cortex, where it disrupts normal neural processing. Unexpected results emerge from experiments described in Figure 2. First, the readiness potential starts building up before the movement. At about that time, the subject thinks that he decides to move (W; green). About 100 milliseconds before moving the subject thinks that he started to move (M; red). Finally, the subject’s wrist begins to move (blue), as indicated by the firing in the wrist muscles. Although conscious intention of move (I) took place before a conscious experience of actually moving (M), the actual neural preparation to move—the readiness potential—preceded both. Likewise, the subjective feeling of starting to move (M) came before the wrist muscles started moving. These experiments reveal that the chain of causation going from our intentions to our actions is not in the intuitive direction. Haggard and Magno applied TMS to MI or to an area called the supplementary motor area (SMA), which lies just in front of MI and plans movements. The TMS electrical disruptions were applied about 75 milliseconds before a subject was expected to react. If TMS changed the actual or judged movement times, these experiments could reveal which area—MI or SMA—was most involved in generating the awareness of movement or the movement itself. The experiment worked. TMS over the MI area delayed actual movement by an average of 201 milliseconds and judged movement by only 74 milliseconds, whereas TMS over the SMA delayed the movement by an average of 113 milliseconds and the awareness by 54 milliseconds. In the latter case, a subject was aware of more of the change in reaction time, suggesting that at least some conscious awareness of a movement must take place between SMA and MI. In a 1991 study of patients with intractable epilepsy, Itzhak Fried, now at the University of California, Los Angeles, and his colleagues, reached a similar conclusion. As part of a clinical procedure to identify which brain areas might be particularly involved in the epileptic activity, Fried and his team stimulated a range of brain areas directly via electrodes and asked the patients to report what they felt. When they stimulated the SMA, some patients felt an urge to perform a movement or anticipated that a movement was about to start. When the stimulating current was gradually increased, the patients made movements of the same body part that they previously wanted to move. Motor areas in the brain (right) plan and execute movements. The supplementary motor area (SMA; blue) plans movements, and the primary motor cortex (MI; red) triggers movement. One of the authors (Haggard) and Elena Magno had subjects press a key in response to a sound and keep track of when they thought they started to move. The experimenters also measured the actual reaction time, while disrupting either SMA or MI with transcranial magnetic stimulation (TMS). TMS over the MI area delayed actual movement by an average of 201 milliseconds and judged movement by only 74 milliseconds, whereas TMS over the SMA delayed the movement by an average of 113 milliseconds and the awareness by 54 milliseconds (left). In the latter case, a subject was aware of more of the change in reaction time, and Haggard and Magno concluded that some of the awareness of movement takes place between the SMA and the MI area. Overall, the findings described here fit very well with current theories in sensory-motor neuroscience. Contemporary theories of motor control suggest that internal models in the brain represent the actual, desired and predicted states of our limbs and the external world. Before a particular movement is made, information about the external world and the motor system goes into what investigators call a forward model (rather like a forward-thinking scheme), which simulates the movement and the sensory feedback that will be generated during the movement. This predicted sensory feedback is compared to a stored representation of the desired sensory feedback, basically a model of what a movement should feel like based on past examples of the same action. In this way, any discrepancies are corrected for prior to the beginning of the actual movement. Such internal forward models accurately account for the type of rapid corrections observed in expert motor performance, as well as the not-so-impressive performance of less practiced individuals, who presumably do not possess optimized internal models. Keep in mind that this type of predictive processing takes place prior to an actual movement. So when we move, we might be aware of the predicted movement, not the actual movement. Even as we try to bypass the free-will minefield, some readers will continue to wonder about it. Some theories assert that there must be a certain temporal order in the perception of events to experience free will. In 2003, for example, Daniel Wegner of Harvard University suggested that feeling free will requires three principles: Intentions must be perceived to precede actions, intentions must be consistent with those actions, and there must be no other perceptible cause of the action. One of us (Haggard) and his coworkers took a closer look at how relations between key events in the production and monitoring of movement could affect the feeling of being in control. To do that, these investigators measured the objective and subjective timing of voluntary and involuntary movements, plus their sensory consequences. As described in the models above, sensory feedback plays a crucial role in planning and executing movements. To get started on this work, the investigators used a Libet-like approach to collect baseline measurements on perceived times for a voluntary or involuntary key press by the left index finger. A motor pushed a subject's finger down on the key to create the involuntary movement. The scientists also collected baseline data on the perceived time of a sensory consequence, which consisted of a TMS-induced twitch of the right index finger. In the experimental trials there were always two events consisting of an action and an effect—the former relating to the left finger and the latter being the right-finger twitch, which was triggered by the key push. Our sense of voluntary movements seems linked with results. One of the authors (Haggard) had subjects note on a clock when they pushed a key with their left index finger (1, left). The key triggered TMS (2) that caused a twitch in the subject’s right index finger, and the subject noted that time as well (3). In the experiment (right), a motor pushed a subject’s left index finger on the key—making it an involuntary movement—and the subject again noted the judged time of the key press and the finger twitch. With the voluntary action, subjects judge the key press and the resulting twitch to happen closer in time than an involuntary key press. These results suggest some type of binding mechanism causes intentional actions to be attracted temporally to their perceived effects. When subjects performed a voluntary action, they judged it to happen later and the somatic effect to come up earlier as compared with the baseline condition. For involuntary movements, subjects judged the action to arise earlier and the effect to take place later. In other words, the two perceived events—action and sensory consequence—seemed closer together in time during voluntary movements and farther apart during involuntary movements. These results suggest some type of binding mechanism that causes intentional actions to be attracted temporally to their perceived effects. Maybe the human mind creates our experience of self agency by constructing a strong temporal association between intentions, actions and consequences. These findings suggest that it may not be simply the perceived temporal order of events that is important for feelings of agency to arise; the perceived time between these events could be important as well. Maybe two events must take place within some window of perceived time to be considered linked. If so, the right experiment might trick the brain into perceiving causality when none exists, or not perceiving it when it was actually present. In one such experiment by Wegner and Thalia Wheatley, now a postdoctoral fellow at the National Institutes of Health, two participants worked together to move a cursor over objects on a computer screen. One of the participants served as a confederate of the experimenter, but the experimental subject never knew this. The genuine subject heard words over a set of headphones that related to particular objects on the screen. For example, a subject might hear the word "swan" while moving the cursor over a picture of a swan. Unbeknownst to the subject, all of the movement of the cursor came from the confederate. The results showed that, when the relevant word was presented 1 to 5 seconds prior to the action, subjects reported feeling that they had acted intentionally to make the movement. In other words, they had experienced will. When the word was presented 30 seconds prior to the action or 1 second after it, however, there was no false feeling of willing the action. The authors argued that this experiment provided clear evidence that the human brain constructs feelings of causal agency after an action has taken place. It could be that a proper temporal order between intentions, actions and consequences triggers the brain—after the fact—to feel a sense of control. On the other hand, the brain could generate a sense of control as a direct result of the neural events that precede movements. Indeed, some studies suggest that a strict reconstructionist view must be wrong, because a strong sense of intention and authorship of action can exist before movement. Fried's study in 1991, for example, provides particularly thought-provoking evidence. As mentioned above, when Fried and his colleagues stimulated the supplementary motor area with low-level electrical currents, some patients reported wanting to move their hands or arms, or feeling an urge to move. In addition, a gradual increase in the electrical current actually triggered the desired movement. This suggests that the conscious feeling of intention or urge to move developed as an immediate by-product of the activity in the motor areas of the brain that actually instructed the movement itself. In work done at the University College London, one of us (Haggard) and Sam Clark found that subjects only experience intentional binding when actions and effects precisely match the subject's intentions, and not when intentions, actions and effects simply occur one after another in time. So feeling in control requires more than just an order of events. The laboratory work described above generally explores why humans feel a sense of control. In real life, though, motor actions make some people feel just the opposite. As we shall now show, three neuropsychiatric conditions—alien-hand syndrome, utilization behavior and schizophrenia—involve a significant degradation in a patient's awareness of action. 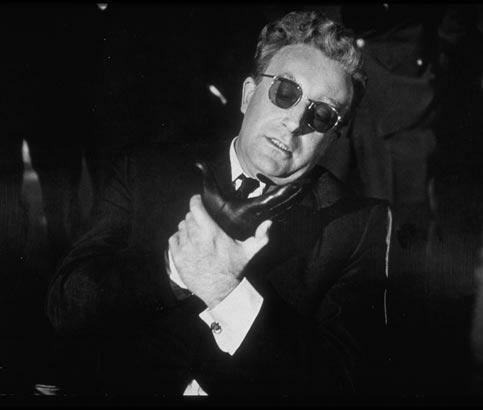 Dr. Strangeglove—played by Peter Sellers in Stanley Kubrick’s 1964 classic film—often used his left hand to control his right, which at times even clutched his throat. This behavior resembles a real-life condition called alien-hand syndrome, in which one hand evades voluntary control. Alien-hand syndrome often arises from a unilateral lesion of the medial frontal cortex, which includes both SMA and medial parts of MI. Damage to the SMA, then, could give a hand a mind of its own. For patients with alien-hand syndrome, or alien-hand sign, one hand evades voluntary control. That is, one hand performs meaningful but often inappropriate actions that the person did not intend. In fact, patients report not being able to control the affected limb and often have to physically stop the alien hand from performing inappropriate actions. In an often-cited example, a lady with the condition was given a cup of tea and immediately commented that it was too hot to drink, so she would let it cool first. As soon as she stated that intention, however, her alien hand grabbed the cup of tea in an effort to drink it, and she had to restrain it with her other hand. In one case, a woman's alien hand tried to throttle her by grabbing her neck, leaving the good hand to physically pull off the alien one. The same patient also experienced her alien hand involuntarily tearing off the bedcovers. The patient remarked that the hand was "a law unto itself" and didn't act according to will. On occasion, while she was drinking from a glass, the alien hand grabbed it—fighting with the good hand until the drink spilled. 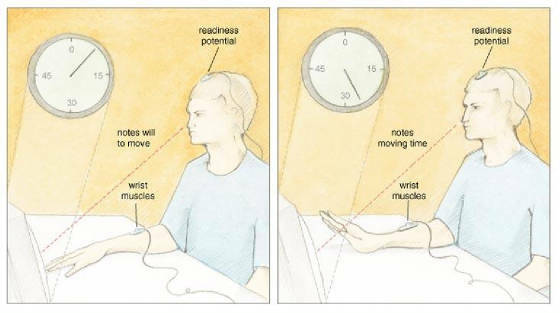 In this condition, the mere sight of an object in the environment often triggers action from the alien hand, even if this movement does not fit the patient's goals and intentions. The question is: What causes this problem? In most cases, patients with alien-hand syndrome suffered a unilateral lesion of the medial frontal cortex or the corpus callosum, and sometimes lesions of both. The medial frontal cortex includes both SMA and medial parts of MI. As described above, some experimental evidence suggests that our awareness of action comes, somehow, from the connection between SMA and MI. So it is possible that damage to the SMA—as experienced in alien-hand syndrome—could give a hand a mind of its own. He also carried out complex (bi-manual) UBs [utilizations behaviors], which too were mainly initiated by his right hand, the left one joining the action after some delay. For instance on one occasion, the experimenter while adjusting the video-camera put his wallet on the table on purpose, the patient spotted the wallet, started to take out all the credit cards and other documents, such as the national insurance number, reading it aloud. The experimenter asked: "Whose wallet is it?" "Yours," replied the patient a bit baffled by such an obvious question, but he went on ransacking it beginning to read aloud personal notes the experimenter had left in his wallet . . . .
Like alien-hand syndrome, no one knows exactly what causes utilization behavior. Neuroscientists do know, however, that these patients usually suffered lesions to the frontal lobes on both sides of the brain. Such lesions could remove inhibitory processing that would normally prevent people from using every object around them. Furthermore, patients may fool themselves into thinking that the actions they performed were indeed intentional. Sarah-Jayne Blakemore of the University of London and colleagues suggested that these patients lack an awareness of internal goals and intentions regarding subsequent movements. In fact, patients are not aware of what they are going to do until after the action has been made. In this view, since there was no awareness of intention before the movement, the patient is left to rationalize the behavior afterward. Lack of control also arises in schizophrenia. Many schizophrenic patients describe an external agent as causing their actions, thoughts, speech or emotions. In the case of actions, patients initiate movement without being aware of it. Blakemore and her colleagues suggested that this particular abnormality in the awareness of action might result from problems in the forward model. As described above, this idea suggests that the brain compares a real movement to a model. As long as the prediction and the result remain fairly similar, maybe the brain realizes that the person created the action. If a schizophrenic patient's predictive mechanism fails to work properly, an accurate prediction of the consequences of a movement is unavailable. Consequently, a self-produced movement could appear unexpected to the brain, which is exactly what schizophrenic patients report. Still, how our brain contributes to our conscious awareness of action remains mysterious in many ways. Nonetheless, the experiments described here do challenge the classical idea of free will. With neural motor activity well in the works by the time a person feels an intention to act, we must wonder what causes that feeling of intention on which we largely base our belief in control. Perhaps that feeling does arise from ongoing computations related to a forward model. Laboratory experiments on volunteer subjects and clinical investigations of patients suggest that predictive signals generated prior to executing a movement might be vital to our conscious experiences of the actions that we make. As most brain scientists already believe, the work described here suggests that our consciousness of control arises from the way that the parts of our brain concerned with movement process information. Haggard, P., and S. Clark. 2003. Intentional action: conscious experience and neural prediction. Conscious Cognition 12(4):695–707. Haggard, P., S. Clark and J. Kalogeras. 2002. Voluntary action and conscious awareness. Nature Neuroscience 5(4):382–385. Haggard, P., M. Taylor-Clarke and S. Kennett. 2003. Tactile perception, cortical representation and the bodily self. Current Biology 13(5):R170–173. Haggard, P., and B. Whitford. 2004. Supplementary motor area provides an efferent signal for sensory suppression. Cognitive Brain Research 19(1):52–58. Johnson, H., and P. Haggard. 2003. The effect of attentional cueing on conscious awareness of stimulus and response. Experimental Brain Research 150(4):490–496. Obhi, S. S., and P. Haggard. 2003. The relative effects of external spatial and motoric factors on the bimanual coordination of discrete movements. Experimental Brain Research 154(4):399–402. Sirigu, A., E. Daprati, S. Ciancia, P. Giraux, N. Nighoghossian, A. Posada and P. Haggard. 2004. Altered awareness of voluntary action after damage to the parietal cortex. Nature Neuroscience 7(1):80–84. Taylor-Clarke, M., P. Jacobsen and P. Haggard. 2004. Keeping the world a constant size: object constancy in human touch. Nature Neuroscience 7(3):219–220. van Beers, R. J., P. Haggard and D. M. Wolpert. 2004. The role of execution noise in movement variability. Journal of Neurophysiology 91(2):1050–1063. Wohlschlager, A., P. Haggard, B. Gesierich and W. Prinz. 2003. The perceived onset time of self- and other-generated actions. Psychological Science 14(6):586–591.